Our economy is an agro-based economy. About 80% of the total population is related with this profession. For cultivating sericulture the climate of Rajshahi is mostly affordable. According to the historian, In the Moghal period some small reeling factories had been established in greater Rajshahi in Bangladesh. In 1897 a sericulture school has been established in Rajshahi. In 1889 a silk business association has been established. After 1947 most of silk was exported to India. During the 16th decade, under the control of small and cottage industry East Pakistan Gov. established 12 silk nursery, 20 expansion centers, 1 silk factory, 1 silk research and training institute had been established in Rajshahi. Al-haj Monjur Faruk Chowdhury, the present owner of USHA SILK industry, wanted to produce silk goods in 1989. He was eagerly interested to build a silk printing industry in his own house by own capital seeing the availability of resources. In 1994 this mill was started to produce main products. Primarily the capital was about TK. 16 lacs and it had only one-show room. Then gradually familiarity and business activity were expanded. Currently its capital is about taka 3.0 crore and it has 3 show rooms. That is USHA Silk is situated in the industrial area of Rajshahi. They use raw material for local & foreign sources. They use electricity, diesel, wood and Kerosene as fuel. The number of employees and show room has decreased compared to last five year. Bangladeshi Silk product market is increasing with the passage of time due to total production and humans being fashionable. Silk items are also being exported to foreign countries such as Italy, UK, etc. Consumers belong to the middle, and high class. Sales department of the company has increased its 50% sales during festivals like Bid, Puja, etc. The growth rate of the industry is satisfactory. But USHA SILK is inconsistent to capture the increasing market. In the year 2010-11 the growth rate increased 12% but the industry growth rate increased about 5%. The market growth rates based on sales are given below. From the above figure and graph, it is clear that the growth rate of USHA silk is higher than other silk industry as a well as whole. This rate increased at an increasing rate during the last 5 years. And for this reasons, it is maintaining a leading position in the silk industry. The firm should ensure the quality of silk products according to the consumer needs and expectations so that the consumer can rely upon these products. Quality of a product is the attribute that consumers expect in a particular product. In case of silk product, these attributes may be longevity, design, color combination, print, comfort-in-use, etc. Different classes of consumer expect different types of quality. One may consider longevity as quality while others may prefer comfortable color, design, print, etc. So, quality should be settled ‘from consumer’s view point. Laundry facilities such as washing and calendaring can be added and offered to consumers. c) Than kapor (Pieces of cloths). USHA STLK factory is trying to include new product items in their product line. Price is a very much sensitive factor. There are various consumers. They measure the quality of product on the basis of price. So, price should be fixed at a reasonable range. USHA SILK factory follows fixed price. The prices of the products are determined before production. The customer has a huge bargaining power. Also the target consumer generally does not like bargaining. They follow the mixed pricing policy. Mainly they follow cost base pricing method. The pricing method is very specific and straight according to present market situation. From table no. 2 & 3, it is clear that prices of different products vary due to quality and types. Ladies’ items charge higher price. Item prices move between products of gents prices item and charge higher than other lower priced items. The above table shows the company’s actual sales in company’s strategy. Here the rate of sale is above 99% and the recent target fulfillment was mostly met. So the result is satisfactory. USHA SILK Factory generally uses director channel for distributing their products. But out of the Rajshahi City they appoint agents to sell their products. The distribution channel of the USHA SILK is shown below. The table sales target through showroom was not meet with the actual sales. It is a matter of concern as to why it was not met. The industry closely achieved its target sales during the last five years. They target two ways, i.e. Show room target and middleman target. The achieved rate of show room is higher than middleman. This may have appened due to promotional problem. There are two types of environment which are micro and macro. But our discussion here is about the macro environment. The population growth of Bangladesh is very high which is about 2.48% (2007). It is the great opportunity to create demand of silk of the customer. As we know, the growing population means the growing human needs. Most of the people expect high standard of living. This conscious pattern is changing day by day in the silk industry. So, we want to give quality silk to the customer. The per capita income of the people of Bangladesh is increasing day by day. But it is comparatively very lower to the developed countries’ income growth. But customers are very much eager to spend their money for buying clothes. The company has to consider changes of major economy variables such as. 4. Savings patterns have large impact on the market place. And also company has to consider these variables for forecasting economic condition. They are always time bound to buy clothes when they fulfill any needs. => The technology of garments sector is also changing very rapidly. => There is a great opportunity to innovate. => The R&D budget is high. => The Usha Silk production technology is a satisfactory medium to fulfill the domestic market. Due to the educational development and consciousness for higher standard of living, the people of Bangladesh want modern and better silk service and quality silk products. There are some few competitive firms that do not control the quality. They do not have good will and registered brand name and they sell their products in lower price. Besides these, some products come through smuggling and also sell in low price. As a result, the factory has lost some of its permanent consumer, especially the price sensitive consumers. But most of the competitors’ positions are alike. The industry is fragmented where there is no leading company. At present, many non-dominant companies are staying in the market and they produce same quality, design, and price them approximately similarly. Future goal of the firm is to graph the maximum market share and expand the present market. It analyses the competitors by reviewing various publication. The 2nd component of competitor analysis is finding the competitor’s current strategy. Here USHA SILK conducts research work to identify the strategy taken by its competitors. The other crucial component of competitor analysis is identifying each competitor’s assumption. Here the firm analyses two types of assumptions i e. assumption about itself and assumption about industry and other companies in it. In this sector the firm analyses its strength and weakness and also those of its competitors. The market share of USHA SILK Industries are 11%, Sapura Silk Industry 14%, Doel Silk Industry 9%, Molina 7.5%, Adarsha Silk Factory 7%, Antar Silk Industry 8.5% and Sunflower Silk Factorv is 7%. The above table shows the position of the USHA SILK in the industry. It contains 8.5% share which is the second best of the industry. That means, we have to consider us as a challenger. The fundamental basis of above average performance in the long run is sustainable competitive advantage. A firm can take three types of competitive strategies, i.e. In it a firm sets out to become low cost producer in its industry. USHA SILK industry tries to maintain cost leadership by managing all the factors related to it. USHA SILK maintains differentiation with its competitors by using various color, design, brand and packaging. Focus: USHA SILK mainly focuses on low cost production to meet the competitive challenges. The main target group of USHA SILK is upper income and middle group. USHA SILK will position its quality products in the mind of customers against competitors (Sapura Silk, Doel, Mohua, and Sunflower). The pricing system of Usha Silk follows cost base pricing. Increase 7 outlets in Dhaka, Sylhet and Chittagong. Company will provide 5% incentives on sales for their respective volume increases. 7. Sales promotion: Increase promotion. It is either positive or negative. First, we analyze the opportunity and threat which exist outside the company and secondly we analyze flip-strength and weakness which exist in internal activities. New entry in an industry for a company is very tough because it depends on brand loyalty, absolute cost advantages and economics of scale. So it is the opportunity. 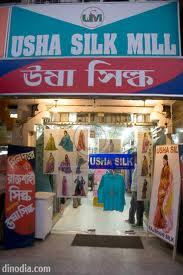 USHA SILK industry has the uniqueness in considering its competitors. Though it has 11.5% of market share, it has a great reputation in the market. This reputation becomes one of the important opportunities for this industry. Our target customers are the middle and upper class people. The target customers are not much prices sensitive. So it is an opportunity for USHA SILK. Usha Silk Industry has some latest technologies. It helps to earn competence. USHA SILK procures 65% of raw materials from abroad which is so tough. The price of USHA SILK product is high and fixed. So customers have no bargaining power. For this, they purchase another substitute product. Inflation rate has great impact on company to collect raw materials because USHA SILK procures 70% of raw materials from abroad. Though the government of Bangladesh is elected by the people, there exists political instability for a variety of reasons. It has its impact upon the market. So it becomes a threat for the company. USHA SILK has many experienced and skilled manpower which show the company’s strength. By using some latest technology, USHA SILK produces systematically. USHA SILK ensures the product quality. It is an important difference from other competitors. So it is also the company strength. USHA SILK reaches its customers by exposing its products by using show rooms, wholesalers, and retailers to the customer. For this, it has full control of distribution channel. We know that the standard value of current ration is 2:1 and the current ration of USHA SILK is 1.36:1. So it is good for USHA SILK. Its standard value is 1:1. That means, it has capacity to pay for the liabilities instantly. The raw material of USHA SILK product is not available in every tune. So it shows the weakness of the company. USHA SILK uses some distributors in some major districts on a highly selective basis. For this, company can not increase its volume as per its expectation. MNC’s innovate new products and add value with their products through research and development whereas USHA SILK does not give attention to this matter. Basically show room oriented business closes the door of mass awareness. * The market cument is so vital. We know that action program allows the product manager to build a supporting budget. The budget is the basis for developing plans and schedules for material procurement, production scheduling, employee recruitment and marketing operations. On the revenue side, the budget shows the forecasted sales volume in units and the average price. On the expense side, it shows the cost of production. Physical distribution and marketing are broken down into finer categories, and the difference between revenues and sales is projected profit. USHA SILK Industry’s targeted net sales will be TK. 9, 37, 31, 200.00. Reduced cost of goods sold will be TK. 5, 14, 57, 020.74. The marketing general and administrative cost will be TK. 2,04,40,979.26. By considering the cost of goods sold company’s gross profit will be TK. 3,22,74,179.26 and by considering the other expenses, its net profit before tax will be TK. 68,33,200. From the above income statement of USHA SILK, we find that the company’s gross profit will be TK. 57298.2 thousand and deductive expenses net profit before tax will be TK. 10935.12 thousand. The sales volume, gross profits and net are determined by considering company’s resources, production capacity, and trend of sales revenue, gross profit and net profit of previous years of the USHASILK. Through the Annual Plan Control, the Company will perform the activities ensuring that the company is achieving its current sales profits and other goals. Through the profitability control, the company will perform the task of measuring the actual profitability of product, customer group, trade channels, and order size. Company’s accounting system is seldom designed to report the real profitability of different marketing activities. To control the marketing activities of USHA SILK Industry, efficiency control plan should be used. The efficiency control plan Company will try to determine how various marketing activities could be operated upon more efficiently. Moreover, to control the marketing activities, it is required to collect data from various sources Here the feedback of customer is very much important. So, the company can collect data from channel members and customers by using following process. So, at the end of the discussion, we can say that USHA SILK Industry will monitor and control the marketing activities through the annual control plan, profitability control, efficiency control and collect data from various sources in above ways. • Aiming to establish competitive price. For that reason, the company is offering optimal price for the product. • Companies have to operate promotional activities in all districts. • It needs to attend in various fair to build up the image. • For establishing better organizational culture, company ensures sound corporate culture. room, the company requires to take diversities strategy. What is the amount of production at the first time? What is the organizational structure of the factory? What is the number of labor starting period? From where do you collect raw material? What factors do you consider for selection of raw materials? What types of attributes do you have? Do you want to add any new attribute to your product? Do you engage in product differentiation? If yes, what basis do you differentiate? What are the sources of new product idea? What type of method do you follow to pricing? How you set the price of new product? What types of distribution channel are you using? How many depots you have? Did you face any problem for using companies own showrooms? How you motivated control your channel members. What are your current promotional tools? Which tools you are emphasize more? What is your current slogan? What is your promotional cost? Do you have any new promotional strategy? What is the price frame of your product? Please narrate your competitive advantages. Do you achieve your target sales? If not, what are the reasons? How many problems you face for selling the products?